that you care for him? the paths of the seas. para que en él pienses? Minister: Let us humble ourselves and confess our sins. Ministro: Que nos humillemos y confesar nuestros pecados. Si afirmamos que no tenemos pecado, nos engañamos a nosotros mismos y no tenemos la verdad. Si confesamos nuestros pecados, Dios, que es fiel y justo, nos los perdonará y nos limpiará de toda maldad. Dios mío, ten misericordia de mí, un pecador. According to the good news of God’s grace, there is no condemnation for those who are in Christ Jesus. For the law of the Spirit of life has set you free in Christ Jesus from the law of sin and death. Let us stand and worship God. Según el evangelio de la gracia de Dios, ya no hay ninguna condenación para los que están unidos a Cristo Jesús, pues por medio de él la ley del Espíritu de vida me ha liberado de la ley del pecado y de la muerte. Puestos de pie, adoremos a Dios. *Kids 3 and under may dismiss to Bible Class during this song. Sermón en español en Salon numero 6. Then the LORD said to Moses, “Say to Aaron, ‘Stretch out your staff and strike the dust of the earth, so that it may become gnats in all the land of Egypt.’” And they did so. Aaron stretched out his hand with his staff and struck the dust of the earth, and there were gnats on man and beast. All the dust of the earth became gnats in all the land of Egypt. The magicians tried by their secret arts to produce gnats, but they could not. So there were gnats on man and beast. Then the magicians said to Pharaoh, “This is the finger of God.” But Pharaoh’s heart was hardened, and he would not listen to them, as the LORD had said. After the death of Ahab, Moab rebelled against Israel. Now Ahaziah fell through the lattice in his upper chamber in Samaria, and lay sick; so he sent messengers, telling them, “Go, inquire of Baal-zebub, the god of Ekron, whether I shall recover from this sickness.” But the angel of the LORD said to Elijah the Tishbite, “Arise, go up to meet the messengers of the king of Samaria, and say to them, ‘Is it because there is no God in Israel that you are going to inquire of Baal-zebub, the god of Ekron? Now therefore thus says the LORD, You shall not come down from the bed to which you have gone up, but you shall surely die.’” So Elijah went. Collect: Grant to us, Lord, we pray, the spirit to think and do always those things that are right, that we, who cannot exist without you, may by you be enabled to live according to your will; through Jesus Christ our Lord, who lives and reigns with you and the Holy Spirit, one God, for ever and ever. Amen. ** Kids return to worship. / Toda la congregación vuelve a reunirse. 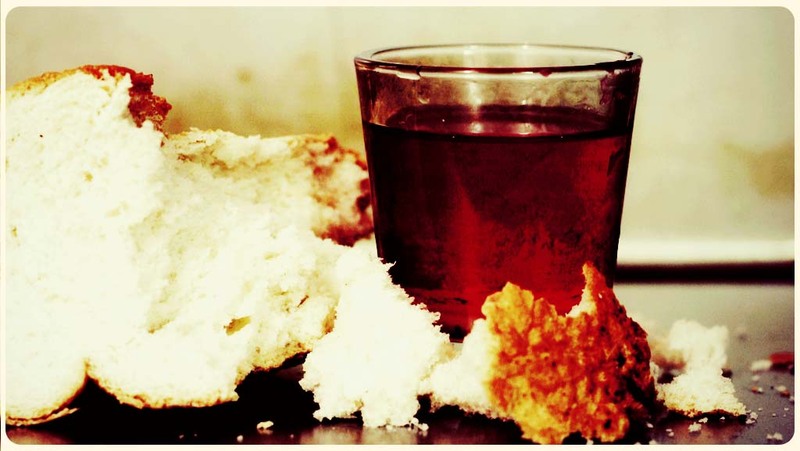 For as often as you eat this bread and drink the cup, you proclaim the Lord’s death until he comes. Thanks be to God for his inexpressible gift! Porque cada vez que comen este pan y beben de esta copa, proclaman la muerte del Señor hasta que él venga. ¡Gracias a Dios por su don inefable! porque a los hambrientos los colmó de bienes. Señor, despides a tus siervos en paz, conforme a tu palabra, porque han visto nuestros ojos tu salvación, la cual has preparado en presencia de todos los pueblos; luz para revelación a los gentiles y gloria de tu pueblo Israel. Children’s Catechism after service. Catecismo para Niños despues del servicio. Wine served in rose colored cups / vino real en copas de color rosita. Grape juice served in the clear cups / jugo de uva en copas sin color.